As a participant in this tour you will fly to Cochin's international airport to be met by Blazing Trails staff and escorted to your hotel in the Fort area of the old city. Here you will be briefed on the adventure ahead and introduced to 'your' 350cc Enfield Bullet and its eccentricities. The following morning we will leave the heat of the coast and head up into the relative cool of the mountains. Whenever riding there will be a leader and 'outrider' guiding and trouble-spotting. A 'sweeper' rider, a support vehicle with spares and an extensively-equipped medic will travel at the rear. The trip includes few long days in the saddle, but does take in some challenging mountain chicanery. These twisty rides will require skill and concentration, so we ask that you have a minimum of two year's riding experience before joining this tour. Once away from the coast, there should be little traffic, but that which we do encounter is likely to be behaving 'erratically' compared to vehicles in the West. The general condition of the roads is, however, very good for this part of the world and the riding experience extremely rewarding. Weather ranges from very warm/hot on the coast, to a cool UK autumn's evening in the hill stations, where we will venture as high as 6500ft above sea level. We would not expect it to rain at the times of year that we run tours in Kerala, but precipitation is possible in the higher reaches of the mountains. The two-night stops on this tour offer the opportunity to have clothes laundered while you get out and explore. So try not to over-pack, as you will want to leave some space for mementos, spices and gifts. This trip is generally characterised by the quality of the riding, the accommodation and the stunning natural settings in which you can enjoy them. We love riding on this tour and are sure you will too. Kerala comprises a narrow strip of land to the west of South India, wedged between the Arabian Sea and the Western Ghats mountains. It is geographically diverse and rich in colourful cultures, natural resources and wildlife. Periyar, India's largest sanctuary, is one of many superb wilderness areas to be found within the state. Equally impressive are the 'Backwaters' – a network of brackish canals and lakes covering hundreds of square miles. Kerala's close relationship with the sea often manifests itself at dinner, with fresh seafood high on the extensive list of Keralan delicacies. For over 3000 years Kerala has been attracting visitors – although not until recently for motorcycle tours… Phoenicians, Arabs, Romans and Chinese have all been trading with this region of India for millennia and it was via the 'Malabar' coastline that oriental spices and technologies first travelled west from India and China. Over the centuries, the value of Keralan trade has encouraged many explorers, traders and invaders. Vasco De Gama arrived here from Portugal in 1498, blazing a trail for future colonialism (and Christianity) by the Dutch and British. The evidence of these immigrants remains on display in coastal cities such as Cochin, still a hub of spice, textile and hand craft export. It wasn't until 1956, nine years after Indian independence, that Kerala was formed from the states of Cochin, Travancore and Malabar. In elections the following year, the Communist Party took power (the world's first freely-elected communist government) and have enjoyed control for the majority of the time since. Kerala's socialist leanings can sometimes manifest themselves as militant trades unionism, with occasional general strikes, but on the whole Keralan politics (in terms of education and healthcare) tend to be more progressive than the rest of India. The state's claim of 91 per cent literacy among its 32 million-strong population is certainly impressive for a developing country and the provision of healthcare is also well above the national average, with Keralans' life expectancy being ten years above the average Indian. In general, the state's inhabitants appear very healthy, open and friendly. Perhaps this is due to their history of maritime commerce with foreign seafarers, or maybe it's just a result of living in such a beautiful place. Leave the British winter behind as you leap merrily onto the flight to Cochin. Arrive in the morning (flight time permitting) for a transfer to your hotel in Cochin for lunch. Here you'll receive a briefing on the trip ahead and be introduced to your 350 Enfield and its eccentricities. We head inland and up into the cool of the hills, covering some 150km in about five or six hours. The ride is fantastic, with long straights passing through shady tropical forest and sweeping bends dipping into verdant valleys. Lofty hairpins then climb ever upwards to reach the stunning emerald tea plantations that tortoise-shell the high Western Ghats around our destination, Munnar. At nearly 1500m above sea-level, anyone who isn't a walrus may choose to don a fleece. A day for both rest and exploration. 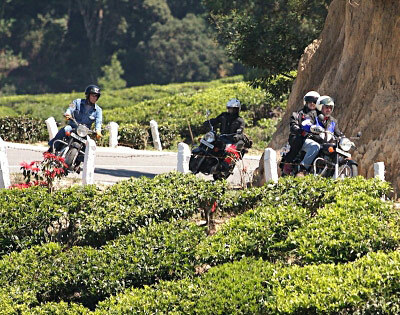 Possible activities include a ride out through the tea plantations and up to Kerala's highest point. There will still be lots of time to get out and explore town, or just kick back and relax. Heading down and out of the Nilgiri range, we cross the plains before heading up spectacular switchbacks to the Palani Hills and the religious fervour in the temple-town of Palani itself. This is an all-day ride and among the best in the world. The views will redefine your understanding of the word 'beauty'. Kodaikanal, at 2100m above Southend, is the geographical high point of the trip. Unless you happen to be half penguin, a fleece is a good idea while taking in the evening views from the heights of our hotel garden. A chance to explore this historically interesting hill station and its surroundings – we'd recommend simply walking around and taking in the vertiginous mountain views and colonial architecture. More 'serious' trekking into virgin forest can also be arranged. The less energetic may prefer a stroll in the botanical gardens, to bob around on the boating lake, or even swing a club on the town's golf course. A day covering about 175km in some six hours. Yet more sinuous twisties carry us back to the plains, then up over the Keralan border to descend through lush cardamom plantation and forest to our destination, the tiny village of Vandanmedu. Here, deep in a forested plantation, our luxurious hotel features a swimming pool, so don't forget the cossie. A short but twisty, twisty little minx of a road delivers us to the edge of India's largest national park, Periyar Wildlife Sanctuary. Our hotel, set in the village of Thekkady, is near the sanactuary entrance and has great views over the forest. Take advantage of the sanctuary's proximity and an evening boat trip out onto the lake, where it's possible to see a huge variety of Indian wildlife. A whole day to get stuck into Periyar Wildlife Sanctuary, or a bottle of wine. For the former option, there are a huge range of wildlife-based activities; for the latter a number of hotels and eateries. Should one remain self-supporting come dusk, then even night treks can be arranged in the park. Heading down out of the mountains and back to the coast, we wind up at a lovely coastal backwater resort near Alleppey. A short hop takes us to Kumarakom, where we will be boarding one of the famous Keralan barges, our accommodation for the night. Our mobile floating luxury hotels will chug out into the backwaters before mooring for the night. Utter peace and relaxation. Heading north, a short ride takes us to the Marari Fisherman's Village beach resort. The beach here is one of the cleanest, quietest and least spoiled on the whole coast and swimming in the warm waters, with the golden beach stretching the the horizon is a very special experience. Another chance for a quick dip in the morning, before a short afternoon ride takes us back to Cochin, where the remainder of the day can be spent wandering the hundreds of bars and restaurants, serving both traditional Keralan fare and international cuisine. From your hotel in Fort Cochin, venture out on a full day of exploration this fascinating city, home to the famous Kathakali dance. You won't be short of things to do, especially if you like to shop for antiques, spices, or textiles. There are also museums and marketplaces through which to stroll, plus an impressive fort and the oldest church in India to visit. In 'Jew Town', a bustling trading enclave is a 16th Century synagogue and the Portuguese-built palace, containing beautiful murals, is another fabulous sight worth taking in. Boat cruises around the harbour, decorated with the famous Chinese cantilever fishing nets, may even afford the opportunity to see dolphins close by. A transfer to the airport for your flight home. Cheerio. You should be able to get by on around £300 spending money if you don't do a lot of shopping. You may want to change a little money (about £30) at the airport, but check the rate before changing a large amount. Cash and travellers' cheques are easily changed in Cochin (where there are also cashpoints). While you'll be riding in the depths of winter, Kerala is close to the equator and very warm. Outside the monsoon season (June-August) rain is rare, but possible high on the mountains, where the climate is generally perfect for motorcycling. The maximum temperature that might be encountered at the coast is around 37ºC; the minimum 6ºC (at altitude, at night). Protective textile clothing is generally more comfortable than leather, especially in hot weather. You will definitely appreciate any venting. Rather than using a padded liner, bringing a fleece is a more flexible option. If your jacket isn't waterproof bring a lightweight waterproof over-layer. Textile bike trousers (with knee protection) are best. A snood boosts warmth and can be pulled over the face to keep dust out. This is a fairly relaxed tour, with no very demanding rides and plenty of two-day stops on which to recover. However, if you have any existing medical condition, please consult Blazing Trails and your doctor before booking. Although there is always the chance of getting a 'holiday tummy', following a few simple guidelines keeps the chances of this to a minimum. The tour will be accompanied by a medic with extensive kit to deal with any problem. If you have any pre-existing medical condition, it is essential that you consult both Blazing Trails and your physician before booking. Bring a DEET based repellent, the mossies in Cochin are legendary. Steamy southern culture/cuisine/wildlife, plus scenic, twisty mountain rides. Easy going for most of the way. Straighter rides near the coast; the best of the riding is in the Western Ghat mountains, where some mega-twisty days await your attention. Potholes are possible and traffic can be manic in the few built-up areas. Tour designed with pillions and couples in mind. Mainly smooth roads; shortish days and romantic destinations. The tourism industry in Kerala is developed and mature compared to most of India. All accommodation is clean and often luxurious. Hand-picked venues chosen to heighten the experience, from plantation stay, to empty beach, luxury houseboat and Cochin's Fort area. Included meals: all breakfasts; 1 lunch; 1 dinner. Old Cochin culture and sightseeing; tea plantation ride out to Top Station (highest point in Kerala); colonial Kodaikanal; Periyar National Park (India's largest); spice plantation stay; luxury houseboats on the backwaters; beautiful tropical beach stay.